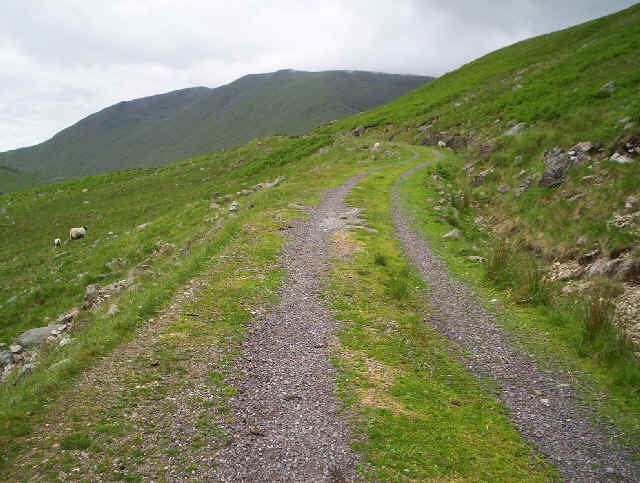 Continuing my quest of climbing as many hills as possible using public transport, two Munros near Loch Awe station, on the Oban line, looked easily attainable. In summer 2008 the first train from Glasgow arrives at Loch Awe at 1047, with the evening departure being at 1850. The first section of the walk follows the A85 for about a kilometre but, as there is a pavement the entire way, this is not a problem. It took me just half an hour to walk from the station to the "official" start of the walk near Castles Farm. 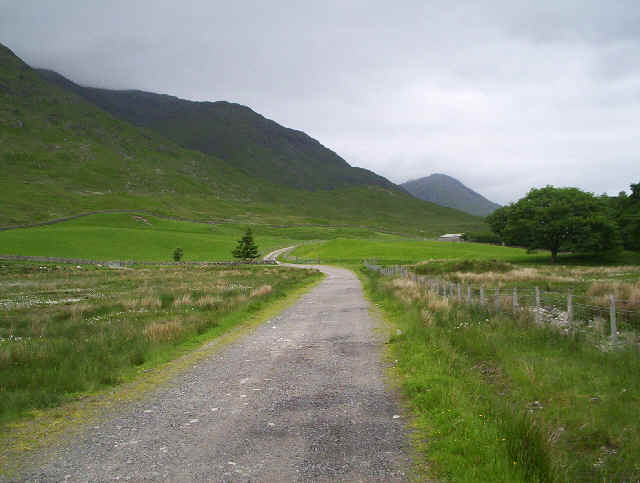 The start of the walk is along the road used to service the hydro-electric scheme under Ben Cruachan. As the road climbs higher the views improve with (from left to right) Beinn a'Bhuiridh and Stob Garbh and Stob Diamh in view across the valley. The hydro road climbs steadily uphill with the day's first objective, Beinn a'Chochuill, just coming into view as the morning cloud clears. It's worth looking back over Loch Awe as the road climbs. There's an irritating drop down to the Allt Lairig Ianachain stream before the hydro road heads off to the top of the Lairig Noe. I took the sharp right turn here as the road heads up to the gated tunnel of the hydro scheme, as can be seen in the photo below. Don't be tempted to go down to the metal gate as the ramp is extremely steep and slippy. The roaring of wter can be heard deep inside the hill. it had taken me just over an hour from the farm to reach here. From the tunnel it's a case of flogging up the hill to the ridge; there is a path which, apparently, starts shortly before the road reaches the tunnel. I missed it and, in any case, wanted to see the tunnel so I cut across the hillside until I found the path. 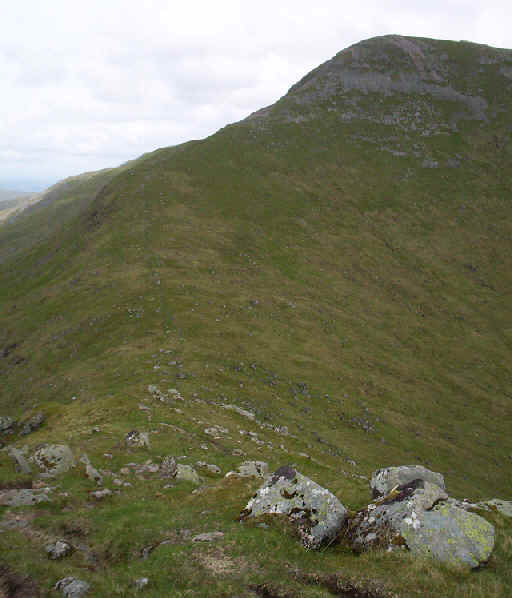 Here, over to the east is Beinn Eunaich, which looks easy enough to climb. The gradient is unremittingly steep but the views of the Cruachan range are stupendous and give plenty of excuses to stop every now and again. 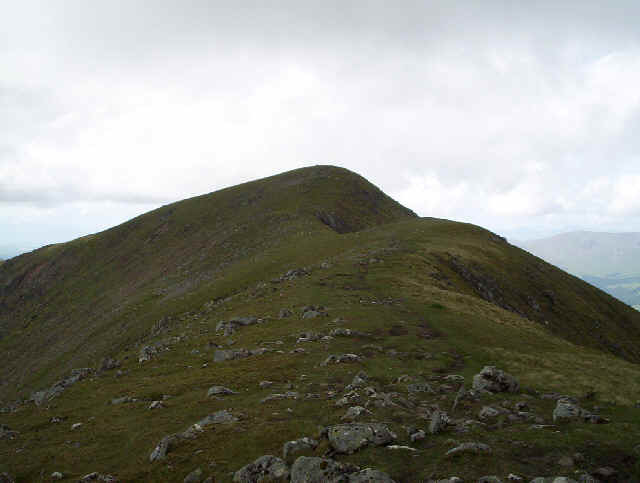 An hour after leaving the tunnel I reached the ridge and turned west towards the summit of Beinn a' Chocuill. By now the sun had come out and the sun cream was smeared liberally over my arms and neck! 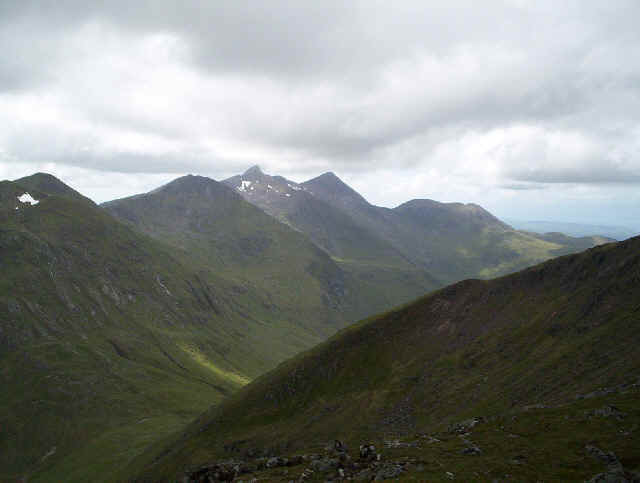 Ben Cruachan and Stob Diamh dominate the view south westwards. Click on the image to see the full size panorama. 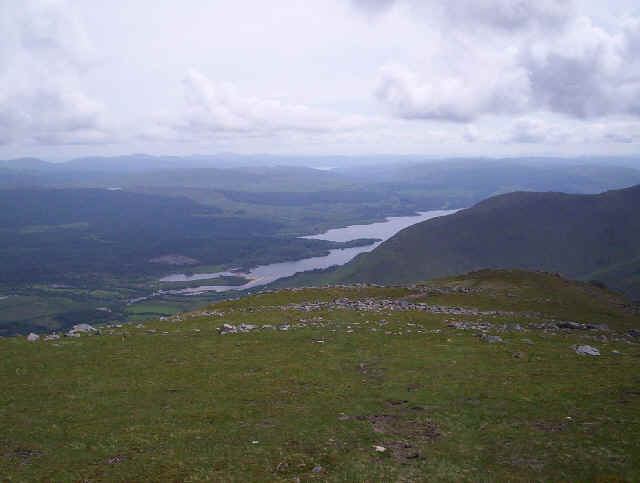 Loch Awe is to the left, the Cruachan hills in the middle, whilst to the right of centre is Loch Etive with Loch Linnhe in the far background. 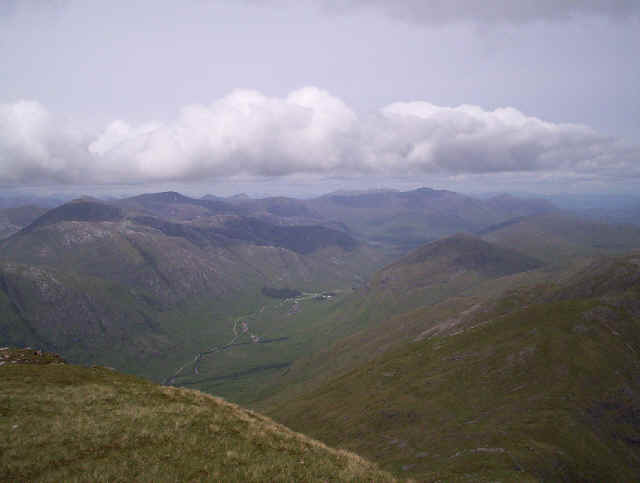 To the right are the hills around Glen Coe. Click on the image to see the full size panorama. 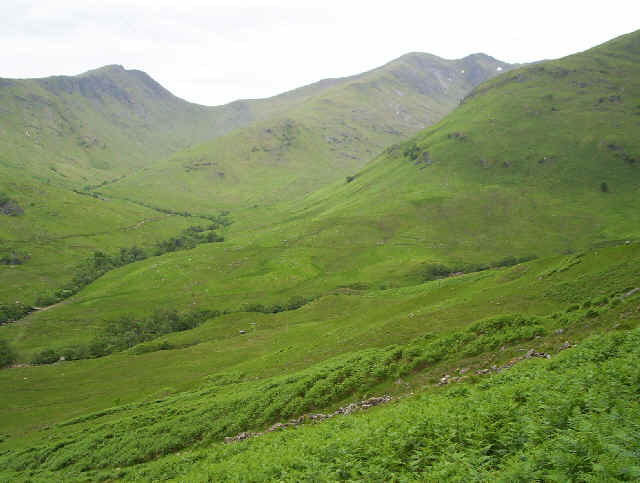 This is the view looking east towards Beinn a' Chocuill and the hills around Bridge of Orchy, Tyndrum and Crianlarich. After twenty minutes eating my lunch and taking photos it was time to press on. I returned down the ridge towards the bealach at 728m. 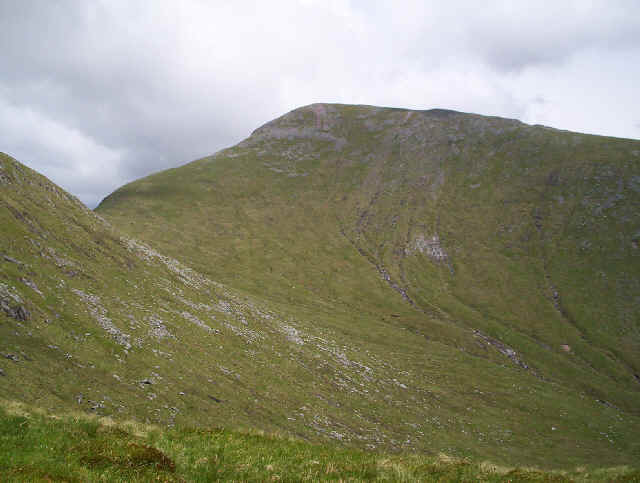 As can be seen there is easy walking from the bealach to the summit of Beinn Eunnaich, mainly on grass, until the more stoney summit is reached. It had taken just an hour from Beinn a' Chochuill. Looking back towards Beinn a' Chochuill the entire ridge walk can be seen with Loch Etive in the background. 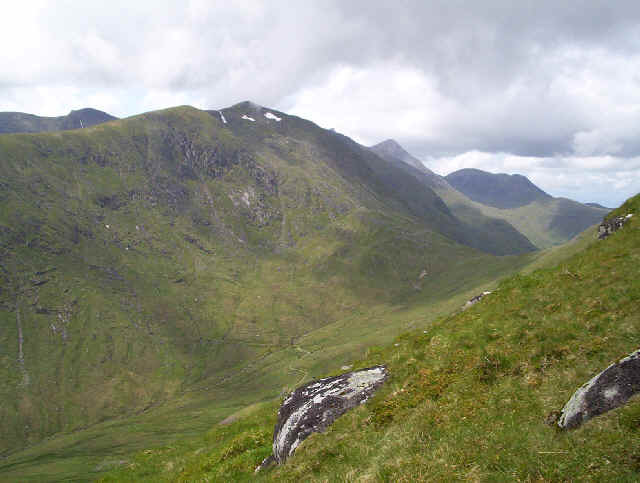 Looking down north eastwards into Glen Kinglass with the three Munros Ben Starav, Beinn nan Aighenan and Glas Bheinn Mhor visible. 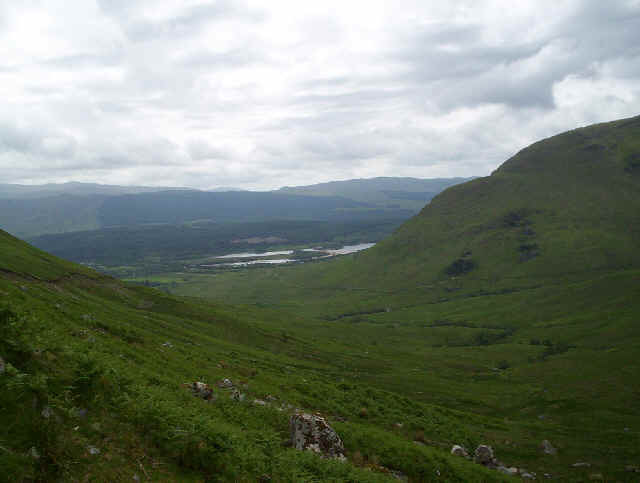 At the head of the valley can be seen a small loch by the side of the track that leads to Victoria Bridge and Bridge of Orchy. 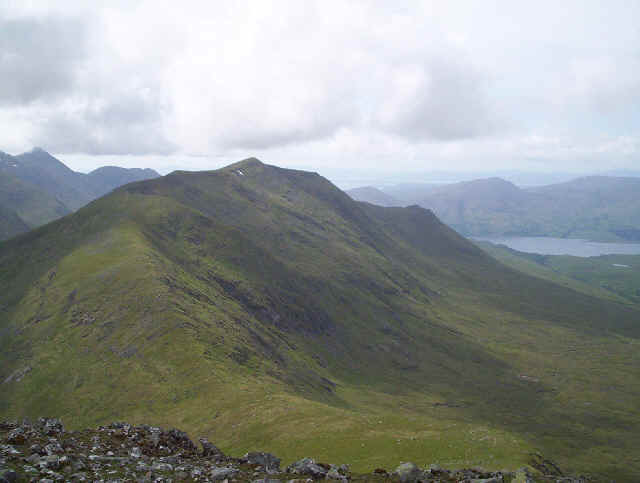 Click on the image to see a 360 degree panorama from Beinn Eunaich. 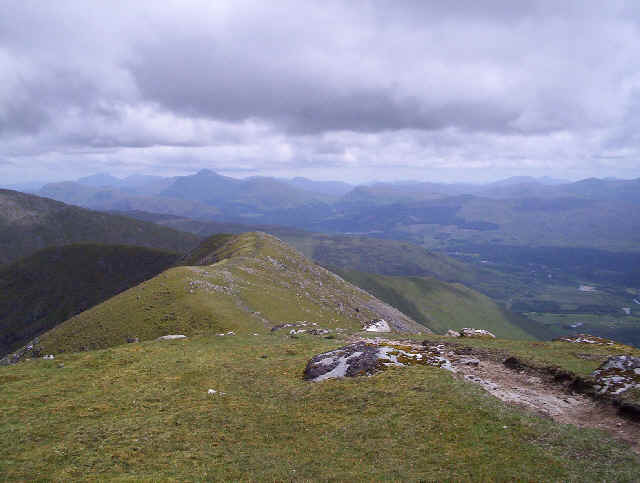 On the left is Beinn a' Chochuill and on the right the Cruachan hills. 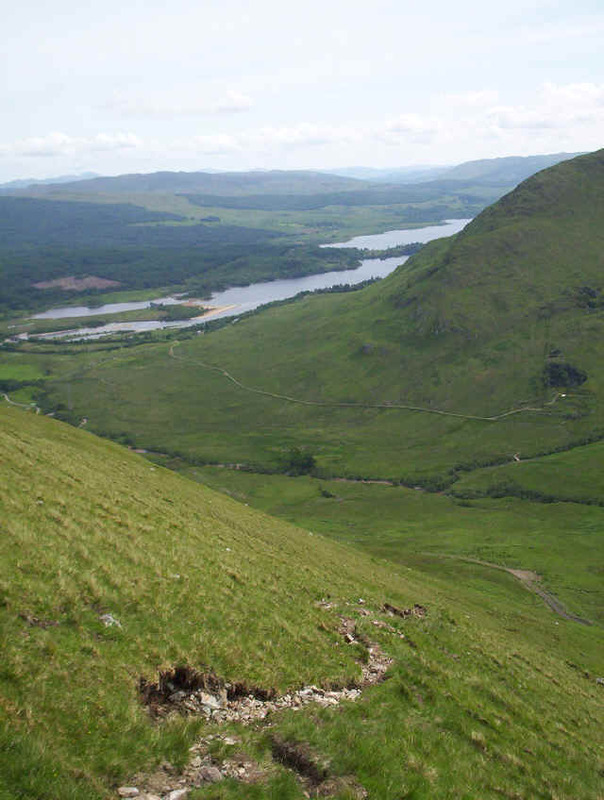 There is a choice of routes back to Loch Awe from the summit. 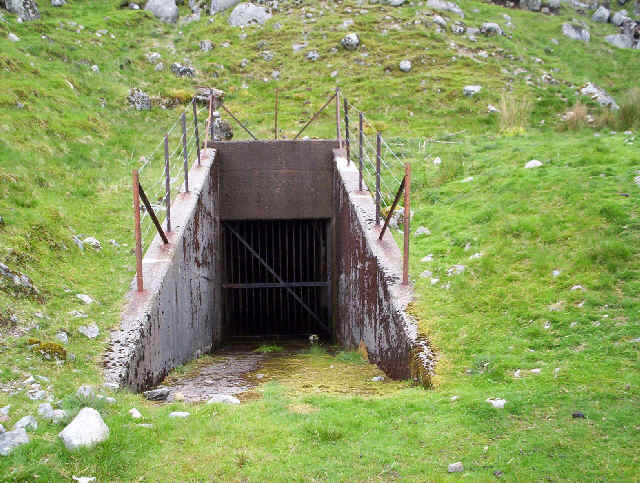 I'd thought of returning to the bealach and then walking down to the tunnel and along the hydro road. However, the sight of this view convinced me that the most enjoyable way down would be along the south ridge towards Stob Maol. At first it's a very easy walk, largely without any clear track. 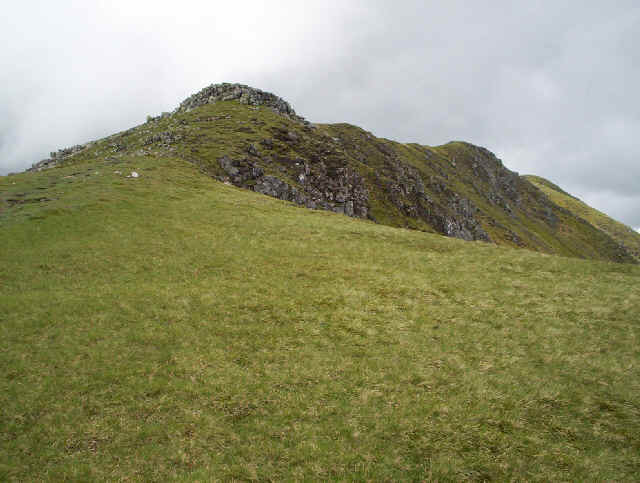 As can be seen the final section off Stob Maol is rather steep and in places eroded. 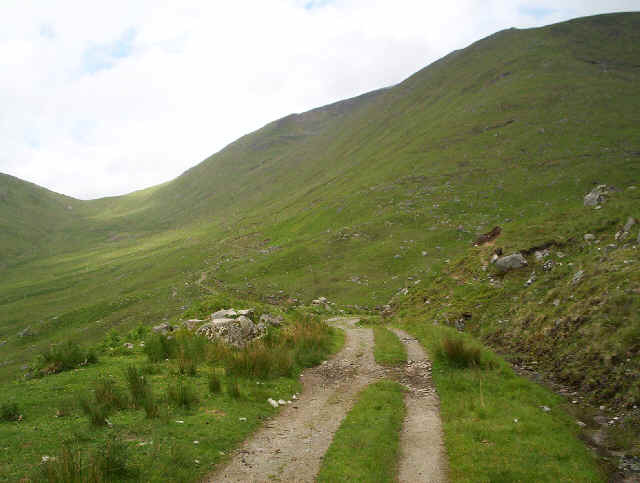 However, the hydro road is soon reached. An hour and a half after leaving the summit I was back at the farm with plenty of time for the train. A visit to the Loch Awe hotel was, sadly, not an enjoyable one. Despite advertising that they are open to the public it was made pretty clear I wasn't very welcome. The hotel seems to cater for "Lochs and Glens" coach tours and two coaches had just arrived. A request for a pot of tea was turned down due to "being short staffed" so I settled for an orange. A wander into the village found a much warmer welcome at the "Tight Line" pub where a large pot of tea cost all of one pound. Highly recommended after a long hot walk! 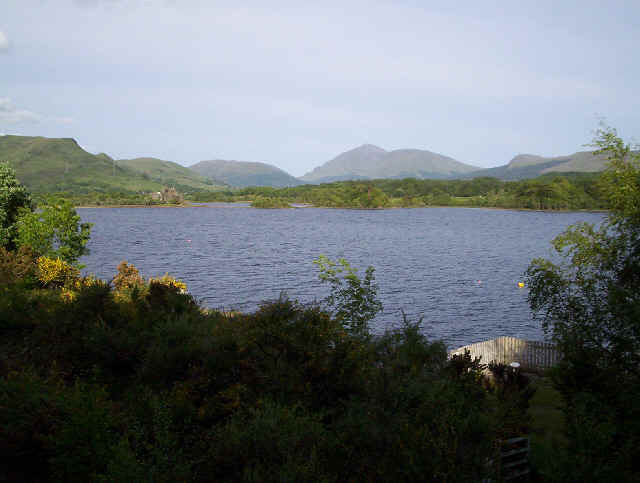 The photo shows Loch Awe looking towards Ben Lui from the railway station. Sadly, the ferry to Kilchurn Castle no longer seems to be open.